For the first time since 2012, the Anaheim Ducks will finish the season without the crown of Pacific Division champions. The last team to be crowned champs besides the Ducks was the Arizona Coyotes, which tells you how far the league has come and what the Ducks have accomplished in those six years. Not only do they not have first place locked in, they don’t even have a playoff spot locked. To say the Ducks have had a turbulent season would be an understatement. They have had injuries left and right to their star players, have had trouble scoring goals since the first game, and haven’t been able to string wins together very well. For a team that was 24-16-9 when the All-Star break hit, they somehow changed their game around and got at least a point in nine of their 13 games in February. With the muddled mess that the Pacific Division has become this year, they have been bumped in and out of a playoff spot more times in the last week then they can count. The odds are that they will make the playoffs. If they do, chances are they will secure their spot with only days left before the playoffs begin. With that said, here’s your one-stop-guide to who they could possibly face in the 2018 Stanley Cup Playoffs and what the future might hold for them. 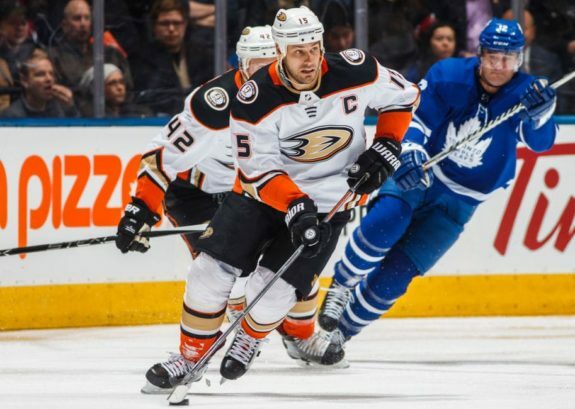 If the Anaheim Ducks fall from their third-place standing in the Pacific Division to a wild-card spot, they would go against the Vegas Golden Knights. One of the greatest stories the NHL will ever have to tell is that of the first season of the Vegas Golden Knights. No one, and I mean NO ONE could have predicted how good the Golden Knights would be. They were breaking records a month into their inaugural season and still keep breaking records, just passing 100 points last week. With all of the praise Vegas has gotten this season, this would be the worst outcome for Anaheim in the first round. 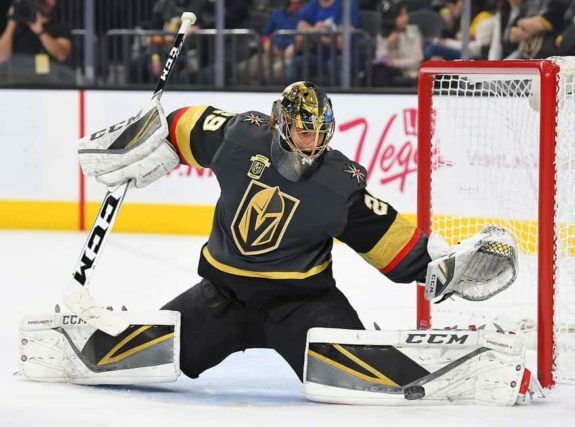 Aside from the fact that they are the first-place team in the Pacific Division, the Golden Knights pack some incredible statistics into their young team. 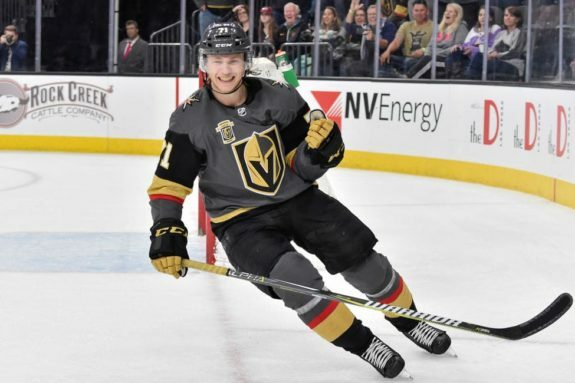 They have five players with over 20 goals to their name on the season (William Karlsson, Jonathan Marchessault, Reilly Smith, Erik Haula, and James Neal). Karlsson (who used to play with the Ducks some time ago) sits fourth in the league with 40 goals in the season. That’s 40 goals in 76 games. His previous career high was nine goals in 81 games. They are fourth overall in the league. They are second behind only the Tampa Bay Lighting for most goals scored in the season and hold a 3.30 goals-per-game average. They rank eighth on the power play, 12th on the penalty kill, and 10th in shots for per game. Those last three statistics are great for the Ducks because if they end up going against the Golden Knights, they aren’t facing an elite team on special teams or even shots. The team itself is something the Ducks could possibly match-up against. The goaltending is where things get difficult. Marc-Andre Fleury has re-invigorated his career in the city that never sleeps. Coming over from Pittsburgh, Fleury now has the second-best goals-against average (GAA) in the league at 2.12, only behind Carter Hutton who posts a 2.02 GAA. He has four shutouts and a .931 save percentage, which is also second in the league behind Hutton. Fleury boasts a better GAA and save percentage then Pekka Rinne, who is widely favored as the Vezina Trophy winner. Although Fleury spent a number of games looking on from the press box because of injury, it didn’t stop him from putting up one of the best seasons of his career. And if by chance Fleury does get hurt either in the first round or before, we all know the Golden Knights have plenty of back up goalies to help. The odds do not favor the Ducks if they go against the Golden Knights. They are 1-2-1 against Vegas during the regular season, and their only win came in a 2-0 shutout. The key to the Ducks’ success against the Golden Knights is scoring goals. They have to generate good offense and they have to control the pace of the game. Vegas is a track hockey team; they will tire you out from end to end because of their speed, and in the games the Ducks lost, they let the speed get the best of them. The only statistic that might affect the outcome of the series is this is the first playoff run for the Golden Knights. Although their team is made up of young and old players who have their fair share of playoff experience, this will be a first for the team as a whole. It could play to their advantage, but it could also help the Ducks in routing one of the best expansion teams ever. The San Jose Sharks would face the Anaheim Ducks in the first round if the Sharks stayed in second place and the Ducks stayed in third. The Sharks are a much better opponent for the Anaheim squad, seeing as they sit eighth overall, just four spots above the Ducks. The Bay-Area team is 11th in goals for per game, 14th in the power play, and second in the penalty kill. That last stat may seem like trouble for the Ducks, but considering Anaheim is fourth in the league in the penalty kill, it seems like a reasonable challenge. They only have two players that have over 20 goals (Logan Couture and Tomas Hertl). The real strength for San Jose is their newest addition, Evander Kane. Since the trade, Kane has been red-hot. He has played 13 games with San Jose and has 13 points (eight goals and five assists) in those games, including one four-goal night. San Jose has always been a team that has performed extremely well in the regular season but has suffered when it comes to playing hockey after the first week of April. This might be the year that things change. They went out and got a huge addition at the deadline, and as of now, things seem to be paying off. And considering they mostly have the same squad that led them to the Stanley Cup Final in 2016, they seem to be in a great position to make a deep playoff run. Luckily for the Ducks, the Sharks’ netminder situation isn’t as intimidating as that of Vegas. Martin Jones holds a 2.45 GAA, the same as Anaheim goaltender John Gibson. He has a .918 save percentage and has four shutouts to his name through 55 games. This is something the Ducks can work with. Martin Jones is playing great hockey, but not nearly as great as he has in the past. The dark horse Anaheim would need to get past is Aaron Dell, the Sharks’ backup goaltender. Although a backup, he holds a 2.66 GAA and a .913 save percentage. That’s better than some starting goaltenders. If Jones isn’t up to the challenge in the first round, the Sharks can easily switch to Dell, which could pose a problem for the Ducks. 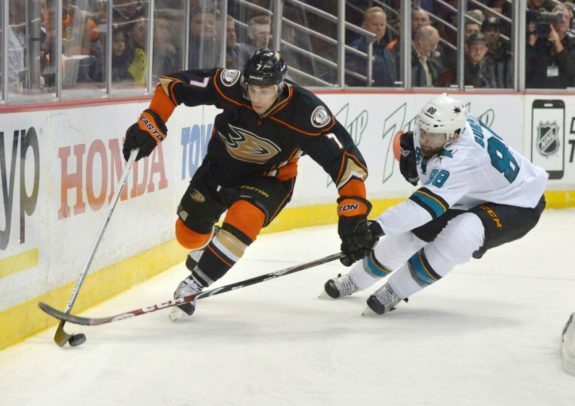 Anaheim has faced San Jose four times this season and holds a 1-1-2 record against them. Considering three out of those four games went to extra time, these teams are pretty even. Much like with Vegas, and much like the whole season Anaheim has had, in order to win against San Jose, they need more consistency with their offense. The problem lies with the fact that the San Jose team Anaheim faced before the playoffs is very different than the one they might be facing come April. Evander Kane and Joe Pavelski have been on fire lately, which could prove difficult for Anaheim’s defense to contain. John Gibson is going to need to keep playing at the top of his game if the Ducks look to get past a San Jose matchup in the first round.